Sunny is left comatose after being struck in the heart by an Abbot. In a dreamlike state, he wakes in a cabin with Veil entering the room. She embraces him as he looks at her in awe. Just then, their son runs in the room, who looks to be about five now, embracing Sunny. He learns his name is Henry. Sunny looks at peace and happy. He suddenly hears a voice calling him. He looks out the window but sees nothing. The figure then is shown to be watching him. Back at the hotel, in reality, MK and Bajie are watching over Sunny. Bajie sees the weird markings on Sunny’s chest and realizes that the ‘Hand of the Five Poisons’ was used on Sunny. Bajie says that nothing can help Sunny. Sunny continues his dream as Sunny is on a farm with his son. Henry tells him he wants to be a fighter when he grows up because he wants to impress a girl named Artemis in the woods. Sunny and Henry playfully spar, causing Henry’s hand to get hit. Sunny apologizes and they run off to the mills together. They see their pigs have been killed with blood markings on their backs. Sunny tells Henry to run back to the house. Suddenly, blood drips on Sunny’s head and he looks up to see the blood coming from the top. Cut to MK dripping water into Sunny’s house. MK and Bajie get into an argument about saving Sunny. Bajie said only the Master could help him, but she won’t. MK wants to go back to the temple and steal the Master’s scrolls to find a cure for Sunny. Bajie doesn’t want to do it but agrees to it. The load Sunny into the car. Sunny is chopping wood and sees the mysterious figure staring at him. It disappears as he turns to Veil. Veil wants to move after seeing what happened to the pigs. Sunny said he will build a higher fence and will protect her. Sunny grabs Henry to eat dinner but notices Henry has a large cut on his hand. Henry tells him he cut himself putting away the plow. Sunny wants the truth. Henry shows Sunny a Chinese Ring sword that his friend Artemis gave him. Sunny forbids Henry to play with that little girl in the woods. MK and Bajie drive towards the temple with Sunny in the back. MK tells Bajie he left the monastery because he found out horrible things about himself and about the temple. Bajie tells MK he left because of a girl, his novice. His novice, Flea, had so much potential, but she misused her powers and killed a bunch of people. After he brought her back to the monastery, they killed her. Jade is bathing and calls for her maid, but no one answers. She comes out and sees looters taking her possessions. Her own maid attacks her and leaves to join forces with the Widow. Her Clipper comes in and updates her on the situation: The Clipper forces are being killed by the Widow and their cogs are leaving. Jade calls they leave immediately. As Sunny is sleeping, he dreams of a hand reaching out to his neck. He wakes up back at the cabin and sees his son in pain. His son is bleeding on his back in what looks like counting marks (like the counts of kill). Henry tells Sunny that Artemis did it because she’s angry that Sunny took the sword away from Henry. Veil comes in and sees the marks. Sunny grabs hot water and towels. He begins seeing hands grabbing at him, but then disappear. Artemis then comes and chokes him. She asks if he remembers her. Sunny begin choking in real life. MK sees the poison spread over his chest. He then puts a ventilator over Sunny’s mouth to help him breathe. As Jade is running to get out of the house, her men are overpowered by the Widow. The Widow has Jade captive. Quinn comes in and greets Jade. Bajie and MK get to the woods near the monastery and head towards the door under the waterfall. Bajie then bails out and starts walking away. MK confesses to why he left the monastery because he killed his mother due to his powers. MK wants to save Sunny because he’s the only one who cares for him and they both can find Azra. Bajie agrees to go in. Quinn and Jade sit across from each other talking about their history from cog to baron. Jade criticizes Quinn about his lack of love. Jade and Ryder truly loved each other. Jade tells Quinn to kill her because that’s what he does. He leaves her alive and tells the Widow to have Jade survive on her own in the woods. While the Abbots are eating dinner, they enter the Master’s chambers. Bajie grabs the scrolls as MK looks for an unknown satchel. Bajie takes the compass MK was talking about. Bajie finds the scrolls and MK find the satchel full of needles. They leave to encounter the Master who attacks them. She welcomes them home. The abbots surround them. 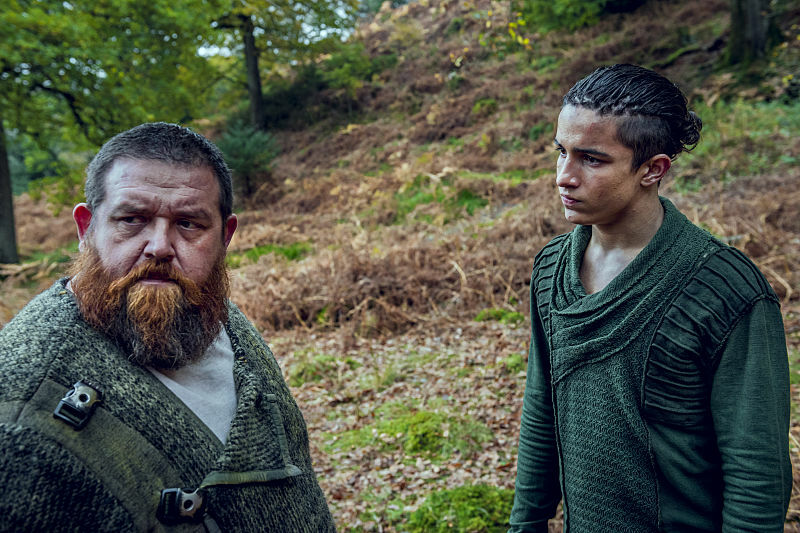 The abbot calls Bajie a disappointment. The Master tells MK to not trust Bajie. MK and Bajie try to get the abbots and novices against the Master, but that does not work. Bajie tells MK to cut the novices to get them to attack the Abbots. The novices begin attacking everyone. MK and Bajie run away. The novices surround the Master as MK and Bajie escape. Sunny comes in to find Veil planning to leave with Henry. Veil seems to think Sunny did this. He runs outside to yell at the figure on why they are doing this to him. He hears Veil scream and runs back into the house finding her dead. He sees invisible footsteps of blood running outside. He sees Henry covered in blood. Henry begins to tell Sunny that he couldn’t let Veil take him. Henry tells him he’s going to be just like Sunny. Henry disappears. Sunny then sees Artemis laughing in the woods and takes his sword into the woods. He yells at her for making his son kill Veil. Artemis laughs that it was Sunny’s fault. Artemis shows up in full form and tells him that his killings are his legacy. Sunny killed Artemis and her brother years ago. She then shows him all the people that Sunny had killed in the past. Sunny battles each of them and is struck by each one revealing the kills on his back. MK and Bajie grab the needles and map to perform the cure on him. As Sunny begins convulsing, Bajie stabs him with the needle. Sunny has flashbacks of his dream life with Veil and his son. Bajie puts the final needle into Sunny, causing Sunny to wake up. Sunny and MK embrace as Sunny knows it was MK’s idea. While resting at the lake, MK visits Bajie and they bond. MK finds out Flea is still alive, because Bajie gave her his powers and freed her, He promised her he’d find her again. MK leaves to check on Sunny. Bajie pulls out the compass he stole and puts it away. 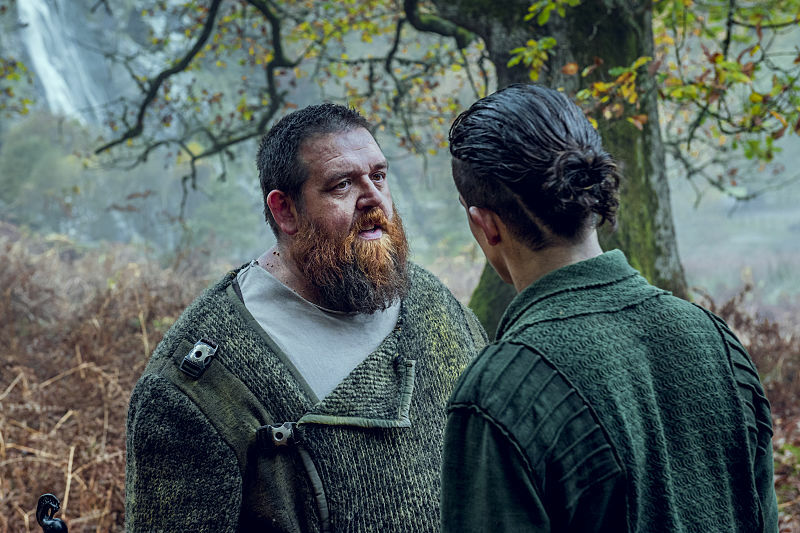 This season of Into the Badlands is doing a fantastic job in, not only the fight scenes, but also playing on the dynamics of the characters. With this episode, the series finally touched on a topic that many viewers, including myself, were curious most about Sunny’s transition from killer to a man with a soul – his killings. Sunny had killed almost 500 people and with each tattoo, he beamed with more pride at the parlor. Now, that he has a reason to live and no longer want to kill, I wonder if the lives that he claimed would ever haunt him. Once Sunny has been comatose from the poison, he had a chance to really think about it. Sadly, we didn’t learn much about Artemis or her brother to fully feel sorry for them. We just know they were one of the many faceless victims that Sunny must cope with. Now that Sunny is awake and aware of what he saw, will this change his mind about helping others? Will he continue this journey just to save himself and his family? The dynamic between MK and Bajie is pretty fun. One was an ex-abbot and the other just recently got out. It’s like a support system for ex-Abbots. They both know life in the monastery; both lost their dark powers; both care about Sunny; and, now are on this journey to find a new home in Azra. Unfortunately, it seems Bajie knows a bit about Azra and is hiding something. Maybe he knows Azra is real, but someplace you don’t want to go back to, hence keeping the compass. Quinn will always have a soft spot for Jade. Instead of killing her, he lets her go off into the forest. Maybe she will run into Sunny there and form an alliance to rescue Veil/Henry and kill Quinn once and for all. Maybe, Sunny will also teach Jade a thing or two about fighting because she needs it badly. Into the Badlands airs on Sundays 10 pm on AMC.